Using the super-sharp radio "vision" of astronomy's most precise telescope, scientists have extended a directly-measured "yardstick" three times farther into the cosmos than ever before, an achievement with important implications for numerous areas of astrophysics, including determining the nature of Dark Energy, which constitutes 70 percent of the Universe. The continent-wide Very Long Baseline Array (VLBA) also is redrawing the map of our home Galaxy and is poised to yield tantalizing new information about extrasolar planets, among many other cutting-edge research projects. whose distances were recently measured. The VLBA provides the greatest ability to see fine detail, called resolving power, of any telescope in the world. It can produce images hundreds of times more detailed than those from the Hubble Space Telescope -- power equivalent to sitting in New York and reading a newspaper in Los Angeles. This power allows astronomers to make precise cosmic measurements with far-ranging implications for research within our own Galaxy and far beyond. New measurements with the VLBA have placed a galaxy called NGC 6264 at a distance of 450 million light-years from Earth, with an uncertainty of no more than 9 percent. This is the farthest distance ever directly measured, surpassing a measurement of 160 million light-years to another galaxy in 2009. Previously, distances beyond our own Galaxy have been estimated through indirect methods. "Our direct, geometric measurements are independent of the assumptions and complications inherent in other techniques," said James Braatz, of the National Radio Astronomy Observatory (NRAO), who worked with Cheng-Yu Kuo, of the University of Virginia and NRAO. Fine-tuning the measurement of ever-greater distances is vital to determining the expansion rate of the Universe, which helps theorists narrow down possible explanations for the nature of Dark Energy. Different models of Dark Energy predict different values for the expansion rate, known as the Hubble Constant. "Solving the Dark Energy problem requires advancing the precision of cosmic distance measurements, and we are working to refine our observations and extend our methods to more galaxies," Braatz said. Measuring more-distant galaxies is vital, because the farther a galaxy is, the more of its motion is due to the expansion of the Universe rather than to random motions. Another ongoing project uses the VLBA to redraw the map of our own home Galaxy. Recent work has added dozens of new measurements to star-forming regions in the Milky Way, The direct VLBA measurements improve on earlier estimates by as much as a factor of two. This improvement significantly aids in understanding the physics of the young stars and their environments. 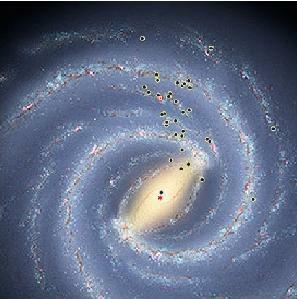 It also has changed the map of the Milky Way, indicating that our Galaxy has four spiral arms, not two, as previously thought. "Because we sit inside our Galaxy, it's difficult to actually map it. These precision distance measurements are our most effective tool for learning about the structure of the Milky Way," said Mark Reid, of the Harvard-Smithsonian Center for Astrophysics. Earlier work by Reid and his colleagues showed that the Milky Way is rotating faster than previous estimates had indicated. That measurement in turn showed our Galaxy to be more massive, equaling our neighbor, the Andromeda Galaxy, in mass. Reid's team also is observing the Andromeda Galaxy in a long-term project to determine the direction and speed of its movement through space. "The standard prediction is that the Milky Way and Andromeda will collide in a few billion years. By measuring Andromeda's actual motion, we can determine with much greater accuracy if and when that will happen," Reid said. A long-term, sensitive search of 30 stars seeks to find the subtle gravitational tug that will reveal planets orbiting those stars. The VLBA's precision can reveal a "wobble" in the star's motion through space caused by the planet's gravity. A four-year program, started in 2007, is nearing its completion. "This study tracks stars smaller than our Sun, seeking evidence of planets the size of Jupiter or smaller," said Geoffrey Bower, of the University of California, Berkeley. "We want to learn how common it is for these low-mass stars to have planets orbiting them at relatively large distances," he added. The project uses the VLBA along with NRAO's Green Bank Telescope in West Virginia, the largest fully-steerable dish antenna in the world. Together, these telescopes can detect the faint radio emission from the stars to track their motion over time. Early results have ruled out any companions the size of brown dwarfs for three of the stars, and the astronomers are analyzing their data as the observations continue. "The VLBA has unmatched capabilities for making unique contributions to many fundamental areas of science. It has a proven track record of enabling transformational research and its new technical enhancements promise a rich harvest of discovery in the coming years," said NRAO Director Fred K.Y. Lo. Astronomers reported on the new measurements and ongoing projects at the American Association for the Advancement of Science meeting in Washington, D.C.